Aminatou Ali Ahmed Haidar was born in 1967 in El Ayoun in Western Sahara. She studied at primary and secondary level in El Ayoun and holds a Baccalaureat in modern literature. Family situation : mother of two children Hayat and Mohamed. Having experienced from her youngest days the atrocities committed by the Moroccan forces of occupation who invaded her country, she joined in the 80s the peaceful resistance against the coloniser. In November 1987, she decided when hundreds of women and men to organise a peaceful demonstration on the occasion of the arrival to the territory of a UN Technical Committee charged with evaluating the requirements for holding the referendum of self-determination planned by the United Nations. The demonstrators wanted to express to the Committee their denunciation of the serious human rights abuses perpetrated by the Moroccan forces since the beginning of the Moroccan invasion on 31 October 1975 and their claim for the holding of a referendum of self-determination in Western Sahara. But the authorities of occupation aborted this attempt at a peaceful demonstration by proceeding to the arrest of over 600 people of whom 70 would lengthen the list of the disappeared. Among the disappeared persons 17 women figure who underwent the worst forms of torture. 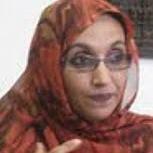 Following her release, on 22 June 1991, she kept undertaking actions to make the serious situation of human rights in the occupied territories of Western Sahara better known. Thus she makes contact with numerous organisations across the world and becomes a real activist in the service of the noble principles of human rights. Aminatou was injured by police during the demonstration of June 17 at El Ayoun, she was arrested and is now in the Black Prison of El Ayoun waiting for trial.